The head of the Executive Authority of the Information and Communication Authority Ali Nasser Al-Khuwaildi said on Sunday that the Authority is proceeding at an accelerated pace to match its work with the great development in the telecommunications sector in the world, stressing that the Authority is the only institution in the Iraqi state that has developed a policy and strategy for seven years. "The President of the Republic, Barham Saleh, met with the President of the executive branch and the chairman and members of the Board of Trustees of the Information and Communication Authority at the Peace Palace in Baghdad on Sunday to discuss the work and achievements of the Authority and the obstacles to its work," the agency said in a statement. The statement added that "the Chairman of the Executive Authority of the Authority Ali Nasser Al-Khuwaildi expressed his thanks and appreciation to the President of the Republic to receive him to the delegation of the Commission and to see the mechanisms of their work as the guardian of the Constitution, and to him that the Commission is moving in a fast pace to be consistent with the development of the large sector in the telecommunications and information technology in the world and in accordance with And the matter of 65 effective under which the body was formed and based on the provisions of the Constitution, which ensured the work of the independence of administrative and financial. 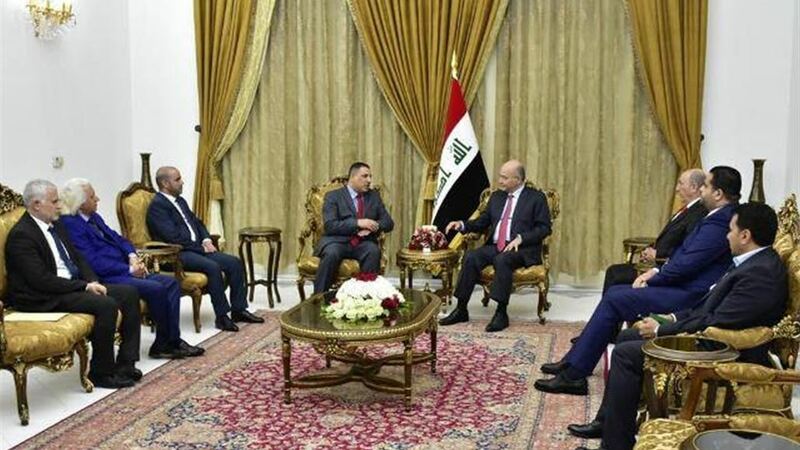 The statement pointed out that "Khuwaili explained to the President of the Republic the strategic projects of the Commission and the most important initiative Dom 2025 projects and objectives and importance," asserting that "the body is the only institution in the Iraqi state, which has developed a policy and strategy for seven years, including the vision of the Commission for what will be the communications sectors And information technology in Iraq in 2025 and its impact on the technological situation, economic, educational, health and financial Iraq. The statement pointed out that "Al-Khuwaildi touched on the achievements of the Commission in the media sector, calling on the President of the Republic to have a role in resolving the issue of debt incurred by the media institutions," explaining that "the Commission submitted to the Parliament an official book based on the decision of the Board of Trustees to set up a mechanism to drop debt In recognition of the media institutions for the great effort made in the liberation of the land of gangs and advocates of crime. " For his part, the President praised the role of the Commission and the necessity of activating its role in supporting the liberalization of the telecommunications and information market. He called on the Commission to "take a greater role in the telecommunications regulatory processes as the mainstay of economic life in most countries of the world." He called for "a formula of cooperation and understanding between the Authority and the Ministry of Communications to determine the powers in terms of management and regulation of the ICT sector." In addition, the Chairman of the Board of Trustees Ashraf Dahan said that "the projects being launched by the Commission, in particular the fourth license project and details of work on this project," calling on the President of the Republic to "have a role in blessing and support such a vital project will transport the telecommunications sector in Iraq to refineries developed countries. " "The Authority is also working on launching the Fixed Broadband project and the Smart Village project as a new opportunity for international companies to invest in the ICT sector." In turn, the member of the Board of Trustees Sarkot Namik, "clarification to the President of the Republic on the mechanism of pricing telecommunications services in Iraq, indicating that" subject to supply and demand, and in this regard, the Commission encourages the submission of offers and services at competitive prices in the interest of the citizen, "calling on the President of the Republic to "Urges the need for the Parliament to hear the opinion of the Commission in terms of its law and the law of communications to be legislated by the House of Representatives." Member of the Board of Trustees Jassem Al-Lami gave a presentation on the role of the Authority in organizing the media sector as the regulator of this sector according to its effective law. He pointed out that "the presence of the active body in international conferences, especially the meetings of the Council of Information Ministers, the godfather, On the organization of the Iraqi media sector in accordance with the mechanisms made him a backer and a pledge to the institutions of Dalwa, especially the security forces in their homes with gangs, calling the criminal. The statement added that "the President promised that he will maintain contact with the Information and Communication Authority and follow up its work, and seek to resolve and overcome all the obstacles it faces in order to take a greater role in the development and liberalization of the policies of the ICT sector, which contributes to bring large investment companies to Iraq, The Commission and the telecommunications companies operating in Iraq to "launch development projects, such as participating in the reconstruction of historical and archaeological areas of Baghdad, and supporting educational projects."